My journey overlapped with many, many humpback whales visiting from Alaska. They migrate to Hawaiian waters every year to have their babies, sing, and mate. You really can hear their songs even outside the water . . . and it is an amazing experience also to hear them breathe and see them spout. Not to mention leaping out of the water -- all 80,000 pounds' worth! Even with all their activities, they don't eat while in Hawaii from late November through spring -- they only do that in Alaskan waters. 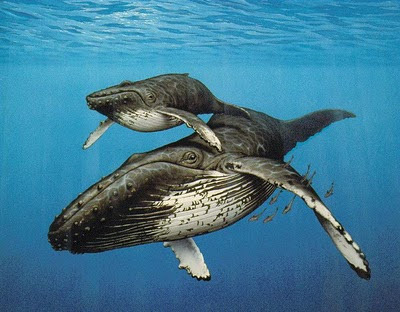 Sometimes the nursing females are skin and bones by the time they migrate back north; baby humpback whales can drink 150 gallons of milk a day. Pretty hefty appetites, yes? Some swam very close into Kealakekua Bay, nursing their babies. We could see them laying on their sides and backs, plus see and hear them breathing out softly in the water. So you understand that nature was already magical, even before I met the kahunas: Mel Ha'Makua Mason and Keahi Kawehi Hanakahi. Both are heartful, compassionate men; Keahi also knew Morrnah Simeona, the founder of Self-Identity Through Ho'oponopono. "She asked me about my prayers," related Keahi. "She looked at me and could tell I pray a lot. I was only about 35 then. They all wonder where I get my chants -- they are very old, and just come through me. She said nobody else chants like that. From when I was little and felt the [Divine] Love, I knew who I was. I just keep going towards the Love, and the chants come. No matter what else happens, for me Love leads the way." Some say Keahi's chants come from long-ago ancestors of the Hawaiians, in Lemuria. All I know is that they vibrated completely through my being, every time I heard him -- including at night on the shore. A whale slapped his tail on the water in response . . . we all were mesmerized at how this could happen. People listening had visions come forth, some of crystal caves and stars. Me? I just drank in the Love. It was like swimming in the warmest, most gentle water ever, all of it resonating through you and tenderly cleansing all pain from your being. All I could do was let that stuff "go". And when the healing chant was over, I felt peaceful and free, aware of everything around me -- yet deeply connected to Something much larger than me. I felt simple and pure in heart. Keahi says that to move forward in this experience of Divine Love, Peace, and Freedom, one needs to be in the presence of someone who knows it himself or herself. You cannot learn it from books, but you can feel it through personal example. This helps you tap into your own Divinity, gaining awareness and appreciation for who you really are. I know this is why I continue to attend live Ho'oponopono seminars. With each one, I am exposed again and again to Dr. Ihaleakala Hew Len, Mabel Katz, and others who live in this way. And yet Dr. Hew Len, Mabel, and Keahi all say there are no gurus. Anyone interested in meeting Keahi themselves can consider attending a seminar in Sedona in April, where he will be featured along with Susan Castle and Paul Bauer. The work will be similar to what I experienced in Hawaii: clearing of issues with Susan and Paul, followed Keahi's blessings (which often include the spontaneous, resonant chants mentioned above). Each facilitates and opens for further evolution. Also, IZI LLC has posted its 2010 Ho'oponopono seminar schedule -- they're happening all over the world! Dr. Hew Len and Mabel are also holding a special "Zero Frequency" seminar in LA this coming weekend, 2/27 - 2/28. To learn more about that, click here. In his talk-stories, Keahi shared that whale song (and breath) is the Earth's breathing. Listening and experiencing this, I felt graced in my Ho'oponopono cleaning. I believe this cleaning helped allow me a way to come to Hawai'i at this time, with these people, and with these magnificent creatures. Had it not been for Ho'oponopono, I would never have been on this path. Mahalo, dear Divinity, for loving me enough to keep nudging me on. *The word "Hawai'i" translates as "the Breath and the Water of the Divinity," and can be used as a Ho'oponopono cleaning tool.